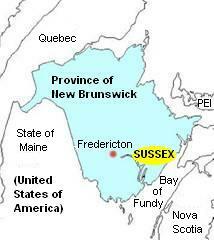 You'll find the Sussex area in south central New Brunswick, on the east coast of Canada. New Brunswick is one of the four Atlantic Provinces, and one of the three Maritime provinces. The town of Sussex is an easy hour's drive from three of New Brunswick's major cities: Moncton (to the east), Saint John (to the south) and Fredericton, the provincial capital, (to the west). The town's latitude is 45 degrees, 45 mins, its longitude 65.50 degrees. See what the weather is like in Sussex by clicking here. From the west, take the Trans Canada Highway (Route 2) to Exit 365, at the junction of Route 10. Follow Route 10 just 35 km to get here. From the St. Stephen/Calais, Maine, US border, follow Route 1 (Mackay Highway) east to Sussex. Exits 192-198 will take you into town. From Nova Scotia and Prince Edward Island, follow the Trans Canada Highway (Route 2) to Exit 423, where you will join Route 1. Exits 192-198 on Route 1 will take you into Sussex. Or you can follow the Trans Canada Highway (Route 2) to Exit 365, at the junction of Route 10. Follow Route 10 just 35 km to get here. The Bay of Fundy, that borders the Sussex region, is accessible from the Atlantic Ocean. From there, you may sail on to the lower section of the St. John River (called North America's Rhine). Or you may choose to proceed on to Chignecto Bay, which branches northeast off the Bay of Fundy. There, you can enjoy the renowned Fundy National Park. The three cities of Moncton, Saint John and Fredericton bordering the Sussex region each have airports. International travelers can choose to fly into either Moncton or Halifax, Nova Scotia, just five hours away by car.